Exhaust Triple Outlet Manifold for 188 & 207 Diesel engines. Comes with two blocking plates, not shown. Fits 430, 500, 530, 630, 470, 570, 480, 480B, 580B, 480C, 580C, 480D, 580D, 480LL, Ind. backhoes; 310E, 310F, 310G, 420C, 350, 350B, 450, 450B, Crawlers; 580, 584, 584C, 585C, 584D, 585D, 586D, Forklifts; 1700, 1835, 1845, 1845S. Also replaces A182084 and A39233. Exhaust Adapter available as Part # R0878A. Manifold Gaskets as Part #R0878G. 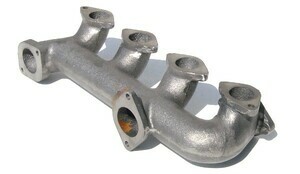 New, aftermarket Exhaust Manifold, Triple Outlet for sale with a solid manufacturer warranty. In addition, we have a generous 30-day return policy if this Case Exhaust Manifold, Triple Outlet for Case 430, 500, 530, 630, 470, 570, 480, 480B, 580B, 480C, 580C, 480D, 580D, 480LL, 310E, 310F, 310G, 420C, 350, 350B, 450, 450B, 580, 584, 584C, 585C, 584D, 585D, 586D, 1700, 1835, 1845, 1845S tractors needs to be returned for any reason. Please see our Parts Warranty and Return Policy links on your left for complete details before returning.